With 92 genera (one extinct and not listed below) and 1162 species [Updated 27.02.19], this family is the largest of the scorpion families. This family is widespread around the world (not found in Antarctica and New Zealand), and are found in tropical, subtropical and partly in temperate habitats. Volschenk, Mattoni & Prendini (2008) has synonymized the family Microcharmidae Lourenco, 1996 with Buthidae. The two genera (Microcharmus and Neoprotobuthus) and 15 species are all transfered to Buthidae. Information about the old family Microcharmidae. Kovarik (2007) has published a revision of the genus Hottentotta. Note that the medical important Mesobuthus tamulus and two other Asian Mesobuthus have been transfered to Hottentotta. Kovarik's revision can be downloaded HERE (browse down to issue 58). Paraorthochirus has been synonymized with Orthochirus by Navidpour et al., 2008). The members of this family are small and medium sized scorpions with a triangular sternum (some genera have a more pentagonal sternum). In many genera (e.g., Androctonus, Apistobuthus, Parabuthus, and other Old World genera) the cauda is usually strong and powerful and the pedipalps are often very slender whereas other genera have elongate appendages, especially the males (e.g., Centruroides, Lychas, Isometrus and related genera). Many species are yellow or brown (or variations of these colors), but black forms are also present. Some species have quite intricate and attractive patterns (e.g., Lychas and Isometrus) and colours (e.g., Centruroides and Uroplectes). Sizes range from about 20 mm (like Microtityus and Microbuthus) to over 120 mm (as in Androctonus, some Centruroides, Apistobuthus and others). An indentification key to the genus Compsobuthus was published by Kovarik (2012) [Free full text]. Several species in this family are highly toxic, but fewer than 20 can be lethal to man. The most notorious species are found in the genus Androctonus, Centruroides, Hottentotta, Leiurus, Parabuthus and Tityus. See Scorpions of medical importance page for further information. 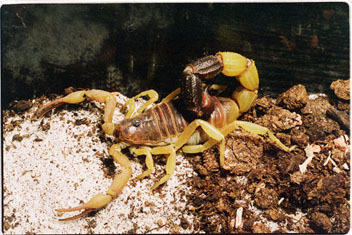 Unlike most other scorpion families, the Buthidae are of both scientific and public interest due to their medical importance in many parts of the world. Several species have also made their way into the hobby. Many of these are safe to be kept by experienced collectors, but the most dangerous species should be avoided. Androctonus crassicauda habitat picture from Kuwait are located HERE. NB! B. jinnahii Amir, Kamaluddin & Jabbar, 2005* and B. rahmatii Amir, Kamaluddin & Jabbar, 2005* was described in the non-valid genus Stenochirus by the authors. I have placed them in Buthoscorpio, which is the valid name for Stenochirus, but formally this has to be done in a scientific journal before it is valid. 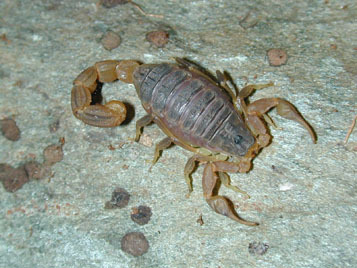 Javed et al., 2010 have studied the descriptions of these two species and concluded that they do not belong to the genus Buthoscorpio. This decsision was also supported by Lourenco, 2012. The two taxa are now Buthidae incertae sedis and are not included in the total number species in Buthidae.